Shop our artisans, crafters for great Christmas gifts! 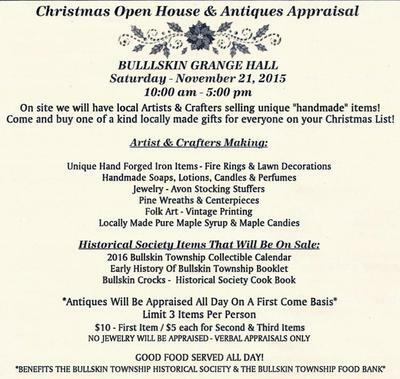 Bullskin Township Historical Society will have it's Christmas Open House and Antiques Appraisal on November 21 from 10 am-5 pm at The Bullskin Grange Hall on Rt. 982. On hand will be artisans, crafters and vendors with unique items for Christmas giving. Hand forged items from the Blacksmith, Soaps, Candles, Lotions, Perfumes for stocking stuffers. Wreaths and centerpieces for Christmas decorating. Check out the local maple products and don't forget to visit the kitchen for delicious food. 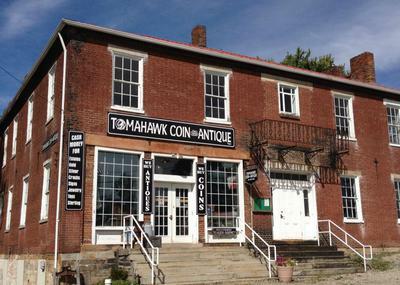 The antiques appraiser will be with us from 10-5. First item is $10, the next two $5 each.Our appraiser is from Tomahawk Coins and Antiques at West Overton. This event will benefit Bullksin Township Historical Society and Bullskin Township Food Bank. Thank you so much for listing your November 21st event, Bullksin Township Historical Society's Christmas Open House for 2015. Wishing this event much success for 2015!